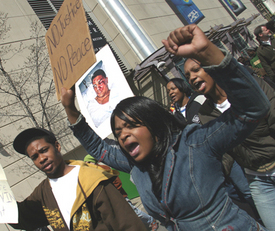 MILWAUKEE — Over 6,000 people gathered here April 18 to protest police brutality rampant in the city. The diverse crowd marched to the federal courthouse to protest the recent acquittal of three Milwaukee County police officers charged with beating Frank Jude Jr., who is bi-racial. The officers, who faced a total of five charges, were acquitted by an all-white jury. Jude was hospitalized after the 2005 beating and had to have facial surgery for fractured bones. The U.S. Attorney may press federal charges against the officers for crimes as serious as attempted murder. One of the officers, Jon Bartlett, will be retried on one charge in June. On April 24, Bartlett went on trial for the 2002 murder of Larry Jenkins. The protest was organized by a coalition including Campaign Against Violence, the Police Accountability Coalition, local ministers and Alderman Mike McGee Jr. Matt Nelson, leader of the Police Accountability Coalition, told the crowd that most of the police violence has been “against minorities from the ages of 18 to 24.” A police community relations spokesperson addressed the crowd, insisting on the professionalism of the police department, but she was drowned out by the crowd shouting, “No justice, no peace.” Rally speakers included leaders of many community organizations, state representatives and senators and family members who have been affected by police brutality since 1981. A coalition has been fighting for a civilian review board since the Jude beating, but the rally theme was immediate justice for Jude.